This lighthouse project is very intensive to build, yet very rewarding. Visit Woodchuckcanuck.com for extensive video story that has been recorded making this project. The lighthouse when complete is 10 ft tall. You can simply make it as a decorative landscape structure, or, convert 1-2 walls to become a door for inside access. Woodworking patterns designed and produced by WoodworkersWorkshop®. This is a paper plan set printed on wide format paper to accommodate the full scale drawings. This is an advanced skill level project. Where given, all measurements are in inches. 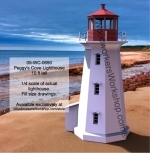 Visit The WoodchuckCanuck.com web site for a video series on the building of this Peggy's Cove Lighthouse. (read more here). This lighthouse project is very intensive to build, yet very rewarding. There is an extensive video story that has been recorded making this project. The lighthouse when complete is 10 ft tall. This plan replaces 19-W2026. Make from one sheet of 1/2 inch plywood, one sheet of 3/4 inch plywood, and common lumber sizes. Wiring and copper roof as shown are not included.